The controversy surrounding gender and women in leadership seems only to be heating up instead of cooling down. In many ways, the Christian community is more polarized than it was even two decades ago. Christians in leadership and in the pews are feeling forced to choose between being a complementarian (those who argue that men and women are equal in dignity, but distinct in role and function within church and family) and being an egalitarian (those who argue that men and women are equal in dignity and role within church and family). In the 1991 preface to the classic complementarian text Recovering Biblical Manhood & Womanhood: A Response to Evangelical Feminism, editors John Piper and Wayne Grudem described their egalitarian counterparts with gentleness and respect. “We consider these authors to be brothers and sisters in Christ, and we have endeavored to respond to them in sincerity and love.” Much has changed in a few short years. When the second edition of this volume was published in 2006, it included a new preface with a much different tone. “Pagan ideas underlie evangelical egalitarianism, based, as it is, on ideas borrowed from cultural feminism. Egalitarianism must always lead to an eventual denial of the gospel.” What has changed in fifteen years to turn one’s opponents from brothers and sisters in Christ to those on the path to denying the gospel? 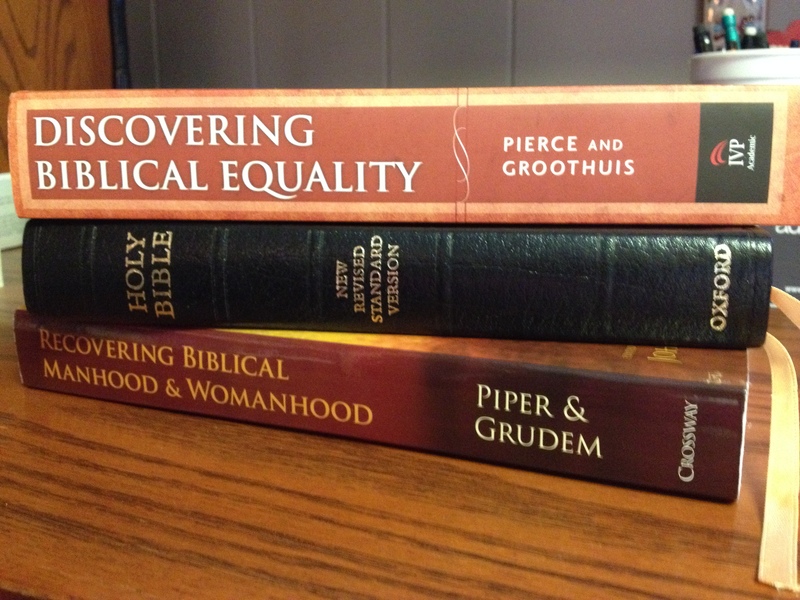 Thankfully, the majority of Piper and Grudem’s volume maintains the tone of the original preface, but even as the rhetoric of complementarians has become more volatile, so has egalitarian rhetoric. I’ve read numerous blogs, tweets, and Facebook posts deriding those who disagree with women in leadership using quite offensive and uncharitable language. As scholars, pastors, bloggers, and Christian celebrities have weighed in on both sides, the actual cares and concerns behind the arguments become quickly lost. Briefly, I would like to try and take a step back from the harsh rhetoric to examine some of the core concerns of the complementarian position and see what I, as an egalitarian, can learn from them. And maybe, just maybe, we can find a way forward in our dialogue. While I believe God calls women into ministry as leaders and pastors in the church, the complementarians I have met are honest, sincere, deep Christians. They care about many of the same things I do. We both care about faithfulness to God’s Word and the flourishing of the men and women in our congregations. They are not demons. The contemporary complementarians I have known do not hate women or even seek to keep them locked at home, barefoot and in the kitchen. In fact, there are many aspects of their position and passion that I admire. Discipleship and Identity – The complementarian vision articulated in Recovering Biblical Manhood and Womanhood has a clear understanding of what it means to be a man and a woman in a society where these identities are in flux. Complementarians care deeply about the discipleship of Christians as men and women. They care about fathers and mothers, sons and daughters growing up in all things into Christ our Lord. Their vision gives both men and women a clear sense of what faithfulness and growth as a disciple of Jesus Christ will look like for them. Christian identity includes our maleness and femaleness and therefore is connected with what it means to be a disciple of Jesus Christ. Takes Embodiness Seriously – This concern is connected with the above concern for discipleship and identity. As human beings created in the image of God, we were created with bodies. Our embodied nature is part of who we are. We are not androgenous Christians, but Christian men and women. Complementarianism takes our embodied human nature seriously and therefore avoids any Gnostic tendencies to disregard our bodies as it relates to discipleship. We are not generic Christians, but Christian men and women – with physical, emotional, and psychological aspects. Concern about women’s equality being equated with homosexuality – If you read closely the complementarian literature, there is an increasing concern that egalitarianism is simply following the same trajectory as secular feminism and will eventually (read: logical necessity of the argument) lead to supporting homosexual practice as a faithful Christian practice. In my estimation, it is this concern that has raised the temperature on the rhetoric in the last few decades. Of those I have read, the majority of complementarians are deeply concerned about faithfulness in the arena of sexuality and have closely tied support for women in leadership with support for homosexual practice and have therefore rejected both. While I appreciate many of the passions and concerns of my complementarian brothers and sisters, I do have problems with their argument against women in leadership. Usually, I would be happy to engage the exegetical arguments surrounding such texts as Genesis 1-3, Ephesians 5, 1 Corinthians 11, and 1 Timothy 2, and problematic formulations of the Trinity, but instead I will refer you to the excellent work in books like Discovering Biblical Equality: Complementarity without Hierarchy and Paul, Women, and Wives. My hope is to suggest a way forward for discussion between complementarians and egalitarians based upon the strength of the complementarian argument. Continue to constructively and charitably engage biblical texts – you may feel like you are beating a dead horse – that this is the 500th time you’ve discussed what ‘women are to remain silent’ truly means – but it matters. The biblical texts matter. If ‘the Bible is the only rule in faith and life,’ then we cannot abandon it because it is hard or the debates difficult. It may seem more expedient in our context to set aside the complicated debates surrounding the meanings of Greek and Hebrews for appeals to experience of women leaders, but that is simply not enough. Any argument from experience may be helpful, but it is never sufficient in a Christian context. Instead, we must recommit ourselves discovering the truth of God’s Word. Take on the tough texts, wrestle with them, and pray that you will be blessed in doing so. Much of this work has been done already, but it must be read and studied (see the sources mentioned above). It is also wise to read the writings of the Council for Biblical Manhood and Womanhood – they should be taken seriously, even if disagreed with. The best way to avoid caricaturing those you disagree with is to actually get to know their arguments and take them seriously. Articulate a vision of discipleship that takes our embodied maleness and femaleness seriously – One of the major strengths of the complementarian position is that it takes our being created male and female as significant for both identity and discipleship. Egalitarians should do the same without saying that men are created to ‘lead, provide for, and protect’ women and women are created to “affirm, receive, and nurture strength and leadership from worthy men.” To reject this vision for being a Christian man or woman does not mean we should reject our embodied nature altogether. The egalitarian position would benefit from a vision of discipleship that does not leaves as ‘mere Christians,’ but takes our bodies seriously. Decouple women in leadership from homosexuality – Considering both the trajectory of biblical revelation and the explicit content of the Bible, I do not think the issues of women in leadership and homosexual practice are logically connected. Therefore, I think it is irresponsible to connect them. One can, without internal contradiction, hold that women are called by God into ministry and that homosexual practice is a sin. Not only do I think the connection is irresponsible, it is also unwise. Regardless of where you find yourself on larger issues of human sexuality, connecting homosexuality and women in leadership shuts down all conversation between egalitarians and complementarians. By decoupling these two exegetical issues, we can more properly address women in leadership without feeling like we are secretly dealing with issues surrounding homosexuality. Each issue will be able to stand on its own and be engaged independently. I don’t have answers for how to move forward this conversation, but I do have hope. I have hope that brothers and sisters in Christ who are committed to biblical faithfulness and Christian discipleship can again voice their disagreements with grace and charity. And I have hope that we can learn from one another and deepen our commitment to growing into the likeness of Christ. Thank you so much Stephen, for your research, your wisdom, and your pastor-heart in this post. Do you mind if I share this with a few people who are anxious about this very topic? I would be honored for you to share it as personally or as broadly as you’d like. I hope it helps move the conversation forward in healthy ways.